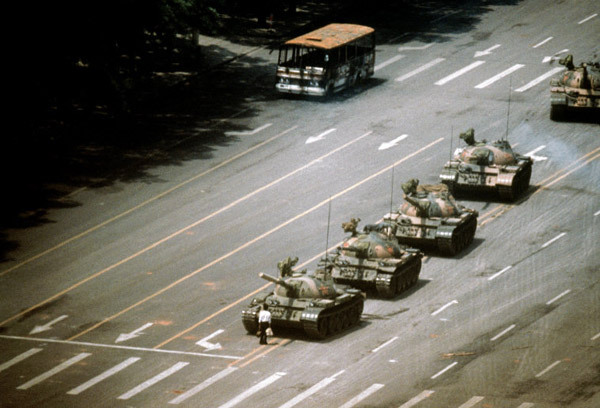 Student protests in Beijing in June of 1989 were met by the Chinese army and this scene was soon displayed in newspapers around the world and on television, showing a solitary man blocking the long line of tanks. Although the lead tank repeatedly tried to drive around the young man, he moved in front of it several times, bringing the entire line to a halt for over 30 minutes. For viewers everywhere, the young man’s act of defiance symbolized the declining power of Communism worldwide. His fate remains unknown. © Widener, Jeff, Associated Press. Accessed 11 July 2010.